Technomad first exhibited at ISE last year on the heels of announcing it would begin stocking products in Europe and had established an international dealer network. The company returns to ISE this year (February 1-3, RAI Exhibition Centre, Amsterdam, Booth 2A57) with an expanded dealer network and two new professional audio products set to receive their international debuts. Joining the Technomad international dealer network in Europe are Audiopole of Marne-La-Vallee, France; Letusa of Alcoron, Spain; and RomAudioVideo of Bucharest, Romania. Technomad also welcomes new dealers from Latin America and Canada as the company builds its global footprint. Bruno Bertrand, CEO of Audiopole, said the company has so far specified Technomad for installation projects at theme parks, resorts and outdoor live events around France. “We have found that the durability of Technomad loudspeakers and PA systems, coupled with excellent sound quality and performance, has been an ideal complement to the roster of 32 professional audio brands that we exclusively distribute throughout France,” said Bertrand. ISE 2011 marks the international debut of two new Technomad products: The OSLO subwoofer and the PowerChiton4 powered amplifier. Both products are designed with the typical weatherproof construction, rugged durability and high-end audio quality that are hallmarks are Technomad advanced loudspeakers and audio systems. The OSLO is a compact, high-power, all-environment 18-inch subwoofer developed specifically for the demanding requirements of themed entertainment applications both indoors and outdoors. It is one of the most powerful subwoofers available due to its very low frequency response (below 100Hz) and high power rating (1250 W continuous). These specifications combined with a high SPL allow the Oslo to produce a clean and powerful bass output. The Oslo also offers excellent performance in the mid-size subwoofer class due to its single 18-inch low-frequency driver, making it the only completely weatherproof subwoofer currently available in the 18-inch format. Though primarily designed for fixed and permanent applications like theme parks and sports venues, the Oslo is also ideal for temporary applications including live sound, corporate audio and theatrical performances. Technomad will also offer the Oslo in a powered configuration featuring a 1600 W weatherproof amplifier module based on the company’s PowerChiton amplifier technology. Technomad first introduced its PowerChiton range of IP66-rated powered amplifier modules in 2008, offering three versions at power levels of 130, 250 and 500 watts. ISE will mark the European debut of PowerChiton4 offering three times the power of 500-watt version in the same compact, NEMA-enclosed package. The PowerChiton4 can produce 1600 watts of power for 8-ohm systems and 1800 watts for 4-ohm systems. Its IP66 ingress protection rating for persons and equipment makes it nearly bomb-proof, delivering a powerful amplifier in a highly protective shell. 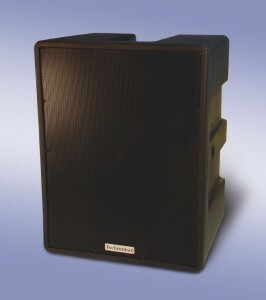 Its low-profile, modular design also gives systems designers and integrators the freedom and flexibility to place the amplifiers closer to the loudspeaker (including wall and pole-mount systems) without hassle – or to install the modules to the back of the loudspeaker with specialized hardware. The combined power, features and design of the PowerChiton4 essentially creates new opportunities for designers and integrators to specify and install PowerChiton amplifiers within distributed audio systems covering large areas — from large stadiums to campus-wide public address and emergency announcement systems. Ethernet/Audio-over-IP networking capabilities enable zone control and a centralized infrastructure tying multiple audio points together.